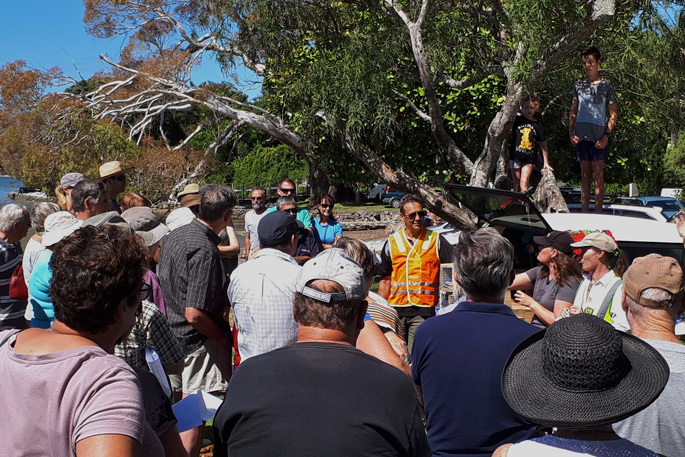 Council’s Community Adviser Glenn Ayo addresses Te Puna residents who turned out for the launch of Te Puna’s Pest-free programme as part of Predator Free Bay of Plenty. Te Puna’s pest free programme got off to a flying start on Saturday March 2, with more than 100 people attending and all 78 traps given out – with a wait list for more. Held at Waitui Reserve, the day aimed to encourage the Te Puna community to band together against rodents. The programme is part of Predator Free Bay of Plenty – a multi-agency initiative supported by Envirohub, Western Bay District and Tauranga City councils, Bay of Plenty Regional Council, Department of Conservation, NZ Landcare Trust and Bay Conservation Alliance. Council’s Community Adviser Glenn Ayo was impressed with the high number of people who turned up at the Te Puna launch. “It’s heartening to see a community respond so well to what is ultimately the responsibility of all Kiwis, that being the protection of our taonga, our wildlife. This commitment shows the awareness people have and this programme offers a valid way to make a difference from your own backyard. “The agencies, such as council, are just there to support the community,” says Glenn. Predator Free BOP Co-ordinator Janie Stevenson says the Te Puna programme is away to a great start. With Autumn around the corner it is a good time for the pest-free action as it is a busy rat season, says Janie. One trap per household has been supplied by Predator-Free Bay of Plenty and the aim is to get a trap into every fifth backyard. The pest-free action, which is a project under the Te Puna Community Plan, aims to lend a hand to preserving bird life in the Te Puna bush and river areas under attack by pests. If anyone would like a tap or advice about the programme, please contact Pest-free Te Puna, Kim Edwards 021 387 929 or Mary Foster 07 552 5516.